Thank you for your interest in our Temperature Monitoring Program! Complete program instructions (duration, data retrieval and submission, etc.) will be available here soon - in the meantime please follow the directions below to get your loggers started and into your habitat as soon as possible. Be sure to visit the Temperature Monitoring Forum to share questions and comments about this program. Monarchs require a fixed amount of heat in order to complete development from egg to egg-laying adult. 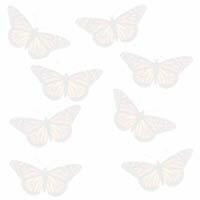 There are two developmental threshold temperatures for monarchs - 52.7F and 91.4F. Between these temps monarch development occurs and outside this temp range no development occurs. The units of "developmental heat" may be measured in "degree days" - if the temperature remains one degree above the minimum threshold temperature for a 24 hour period this is defined as one degree day. Similarly, if the temperature is two degrees above the minimum for 12 hours, one degree day is accumulated. As you can see, when temperatures are several degrees above the minimum the number of degree days can accumulate quickly - a single warm summer day may contribute 30 or more degree days. The total number of degree days (DD) required for monarchs to develop from the time an egg is laid to the time at which an adult female lays her first egg is 720 Fahrenheit degree days. The running total allows us to calculate the potential number of generations of monarchs in any given area - typically based on airport temperature readings. We already know that observations don't seem to agree with these readings so one goal of the temperature monitoring program is to clearly show any temperature differences between a monarch habitat at the height monarchs are developing (.5m) and the local recorded temperature (1.5m). Each Temperature Monitoring Kit includes two (2) loggers (installed in yellow keyfobs), two (2) sun shields (white rectangular pieces, one (1) probe (with coiled cord), one (1) USB adapter (blue), and a small bag of mounting hardware. (1) The sun shield (rectangular white piece) is necessary to reduce the possiblity of radiant heat transfer to the logger, which could introduce false temperature readings. (2) Insert a short stainless steel screw into the outermost hole in the sun shield (closest to the edge) and insert a long(er) stainless steel screw into the more interior hole. (3) Place the L-bracket over both screws and secure with included locking nuts. Tighten the nuts as much as you can with your fingers and then use a phillips head screwdriver and turn the screws another 3-4 turns. This will compress the sun shield slightly and secure the bracket in place. (4) Choose your mounting location and secure the L-bracket to a vertical surface within your habitat using the included galvanized screws (actual placement/installation will vary based on your project). For our Monarch Degree Day study you will need to install one logger at a height of .5m (~20 inches) and the other at a height of 1.5m (~59 inches). 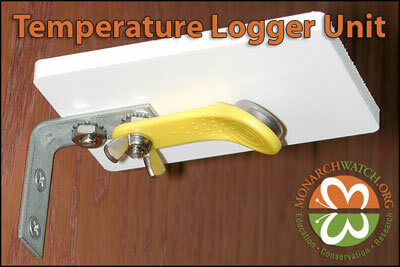 Please continue reading for information about setting up your logger to begin recording temperature measurements - it will not collect any data if these steps are not taken. Attention Beta Testers: To convert your prototype logger into a standard one all you'll need to do is remove the logger from the old orange shield using a length of wire, razor blade, etc. to "saw" through the adhesive foam, rub off the majority of the residue and then snap the logger into the empty keyfob you received. In order to start your temperature logger and retrieve the data it collects you need to make sure a few bits of software are installed on your computer so that it can properly communicate with the logger hardware. Once you have verified that everything is installed properly (using the information provided in the links above) you are ready to initialize a new mission for your logger to carry out. With the OneWireViewer application running touch the probe to the temperature logger (or press it firmly to maintain a hands-free connection) and you will see something like the following when you select the new device (with the "DS1921G-F5" designation) that appears in the Device List. Note: There will be some minor Mac/PC differences in the window's appearance but the content should be the same. If this is not the case, repeat the steps above to properly mission your logger.